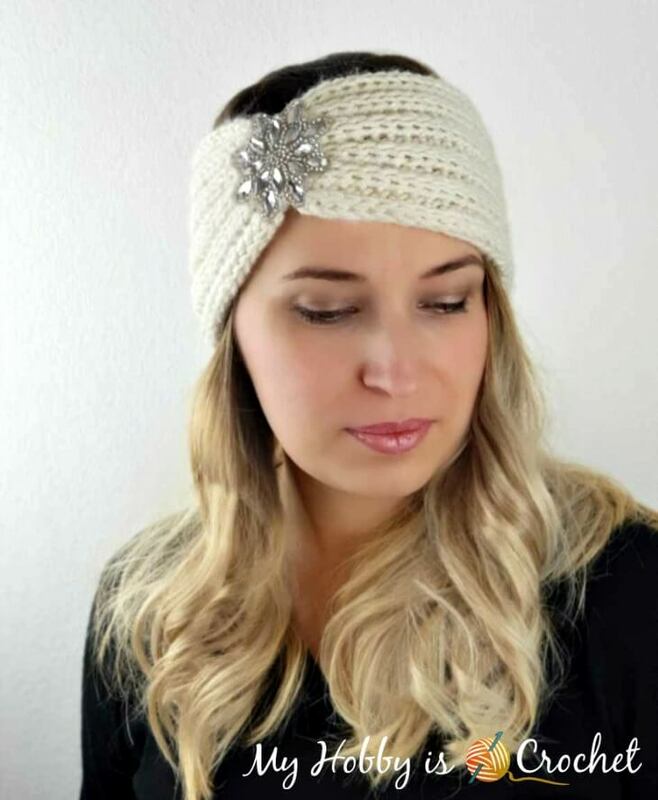 This stretchy knit-look crochet headband/ ear warmer has a great ribbed texture, reminding of a “knit 2, purl 2” knit ribbing. You can wear it as you wish - with the cinched part on top of your head or off to the side. 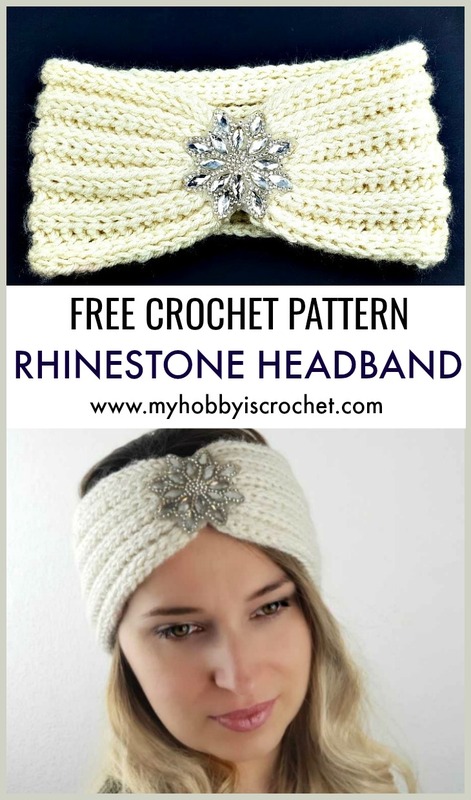 The rhinestone applique gives an extra touch, but you can also leave the headband simple, without the applique. Headband measures unstretched approx. 18 inches around and is 5 inches (12- 13 cm) wide. The piece has a lot of stretch. I like my hats and headbands to have a snug fit. If you like yours a bit looser, you can add 2 or 3 extra chains to begin. I have reused an old applique (7 cm) from a child’s dress that I have glued on with a hot glue gun. back bump of chains: Click here for my picture tutorial. 1) Yarn Over Slip Stitch (yo-slst): Yarn over (yo) and insert the hook into 2nd chain from hook; yarn over and draw the yarn through the chain (You have now 3 loops on the hook). Having the 3 loops on hook, pull/slip the first loop on hook through the next 2 loops on hook to complete a Yarn Over Slip Stitch (yo-slst). Click here for my PICTURE TUTORIAL for both yo-slst and yo-slst-blo! 2) Yarn over slip stitch back loops only (yo-slst-blo) : work the stitch as described above, but inserting the hook only into the back loops of the stitches. 3) Yarn over slip stitch into 3rd loop at front (yo-slst into 3rd.loop at front): Yarn over (yo) and insert the hook into the loop under the front loop of the indicated stitch ; yarn over and draw the yarn through the stitch (You have now 3 loops on the hook). Having the 3 loops on hook, pull/slip the first loop on hook through the next 2 loops on hook to complete a Yarn Over Slip Stitch (yo-slst ). Check out here my PICTURE TUTORIAL for the yo-slst 3rd.loop at front! The ear warmer is worked lengthwise in rows, then the short ends are sewn together and cinched along the seam. Before you begin crocheting, please check out my stitch tutorials linked above. 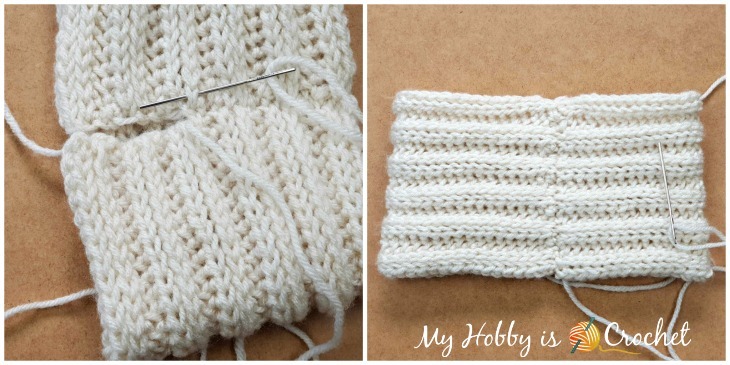 I recommend you to check out my detailed Picture Tutorial for the Knit-look Ribbing “knit 2, purl 2” also! Place stitch markers into the first and last st of the rows, to not lose the sts on the edge. The pattern looks great on both sides of the work, however I think that one side (the right side) is just a bit prettier as the other one (wrong side). Note: ch 1 at beg of rows will not count as a stitch. Rows 7-22: Repeat as rows 3 - 6 (always alternating two rows of yo-slst into 3rd. loop at front with 2 rows of yo-slst-blo), until you reach desired width, ending with a row of yo-slst blo on right side. Note: Repeating the rows of yo-slst blo and yo-slst into 3rd loop at front might be confusing! 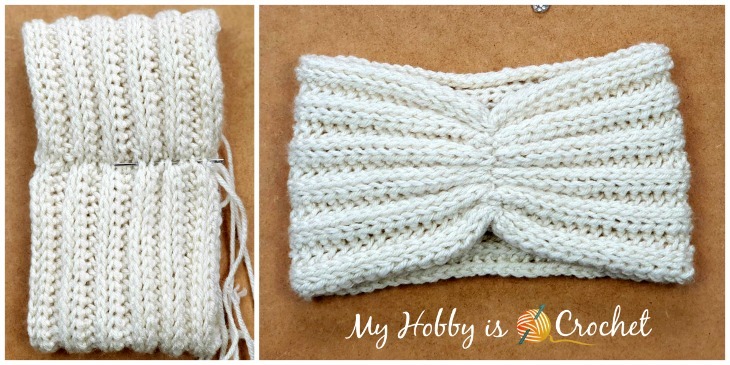 I recommend you to check out my detailed Picture Tutorial for the Knit-look Ribbing “knit 2, purl 2”! This row will push the v’s of the sts from previous row to the front of the work and the long edges will look more alike. Cut yarn, living a long yarn tail that will be used to sew the short ends together and to create the cinch. Fasten off. 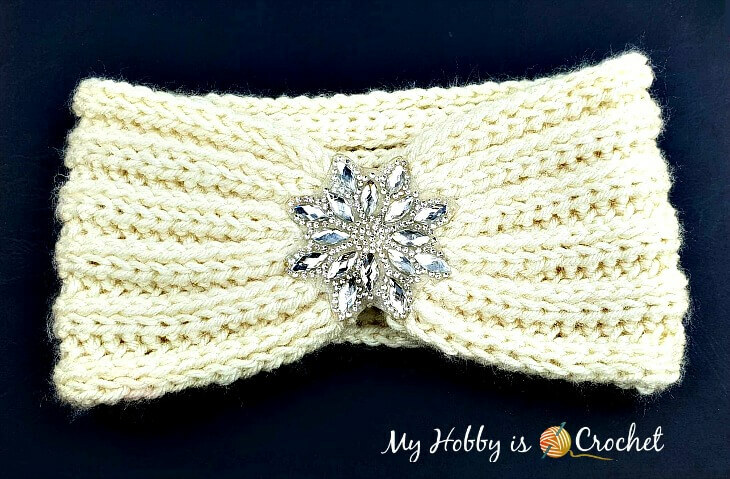 FINISHING: With the RS facing you, lay the short ends of the headband one above the other, making sure that you line up the ridges on both sides. 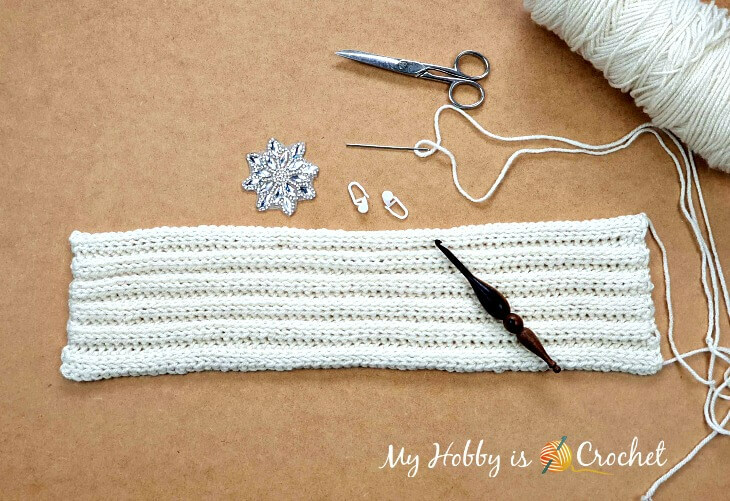 Thread the yarn needle and sew short ends together, using the Invisible Horizontal Seam in Knitting; see this VIDEO Tutorial! Do not cut the yarn yet, proceed with the cinch. Secure with a knot, and repeat weaving in and out from one edge to another along the seam. Fasten off. Weave in all ends. Attach the rhinestone applique to the cinched section. ( I have glued it on with a hot gun.) And you’re finished! 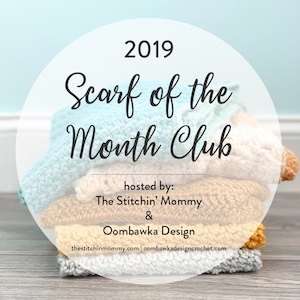 Many thanks to Red Heart Yarn for providing the yarn sample used for this pattern!